From 5 January 2015, all GP practices in England are free to register new patients who live outside their practice boundary area. These new arrangements are voluntary for GP practices. If the practice has no capacity at the time or feels it is not clinically appropriate or practical for you to be registered so far away from home then they can still refuse registration. The practice should explain their reason to you. Once you have decided to register with a GP practice away from your home address, you will need to choose a practice that is accepting registrations from outside of their traditional practice boundaries. You can find this information by contacting the GP practice directly. They may have this information on their practice website or on their practice leaflet but the best way will be to contact them by telephone and asking a receptionist. Because of the greater distance to your home, the GP practice may register you without the responsibility to provide you with a home visit when you are not well enough to go to the practice yourself. When you register with a practice away from home, without home visits, you will be given information about what you should do in those circumstances where you need to access care whilst at home. You may, if your circumstances change and it is no longer clinically appropriate or practical for you to be registered away from home, be asked to consider registering with a practice closer to home where your care may be better provided at that time. 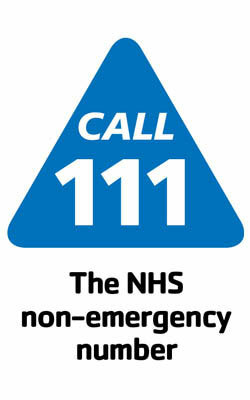 Should you become too ill to attend your registered practice in person or your practice advises that they are unable to assist you over the phone, contact NHS111 who will direct you to the right service for your needs. If you would like to register as an Out of Area patient, please come to reception to pick up a form.